Plant of the Month: Pachysandra Terminalis - Japanese Spurge - Basics Landscpaing Co., Inc.
Characteristics: A shrubby evergreen ground cover, grows 8-12″ high and spreads to form a dense carpet of rich, dark green foliage. Produces tiny flowers in early spring. 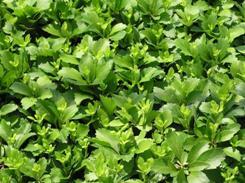 Plant: Use as ground cover in shaded areas. Mr WordPress on Nassau and Suffolk County Holiday Decorating Pros! Basics Landscaping of Long Island is committed to being recognized as the pinnacle in our industry through the products and services we provide to our clients and the image we portray to our community. to take our year end survey to help serve you better.